(MENAFN - Daily News Egypt) Centuries after their deaths, the remains from the Roman era still astonishes people with the details of their lives in Egypt. While we are in the beginning of 2019, the treasures left from the Roman period, begun in 30 BC, still emerge. The ministry of antiquities announced the discovery of several relics dating back to the Roman and Greek era at the Tuba Metwah archaeological site in Al-Amriyah in Alexandria. The unearthed monuments included a number of connected walls—which were built according to varied designs and methods—as well as large overhead units and remains of various types of food with cooked inside of them. The large ovens were separately built within the walls. The stoves were restored several times during that era, as the mission found fire marks in the different layers inside the walls. The bones of bird and fish remains were found inside many of them. Ayman Ashmawy, the head of the Ancient Egyptian Antiquities Sector at the ministry of antiquities said that having such a large number of enormous and countless ovens indicates that the area was used as a service unit for militants or camps. The discoveries emerged at the mission's first excavation season. Moustafa Waziri, secretary general of the Supreme Council of Antiquities, and head of all Egyptian missions working on excavations in archaeological sites, stated that such a discovery is extremely unique, as it leads the mission to believe that the site was an industrial and commercial area during that era. He also added that the connected walls are built in different methods which the mission will start studying. Waziri explained that some of the discovered walls were built with asymmetrical stones, while others were built with carefully cut stones that all look alike. The mission also found various-sized and shaped cooking pots with burn signs, which indicate that these were the utensils used for preparing the food. Two human remains were also found during the excavation work. The corpses are believed to belong to people from a lower-social class who were buried at the site after it was abandoned. One of the found human remains belongs to middle-aged woman, who was found next to a wall and close to a used oven, wearing a copper ring. The mission is to complete studying the discovered relics from the site to disclose more about its and the exact decade it belongs to. This is the second Roman-era discovery to be unearthed within a few days. 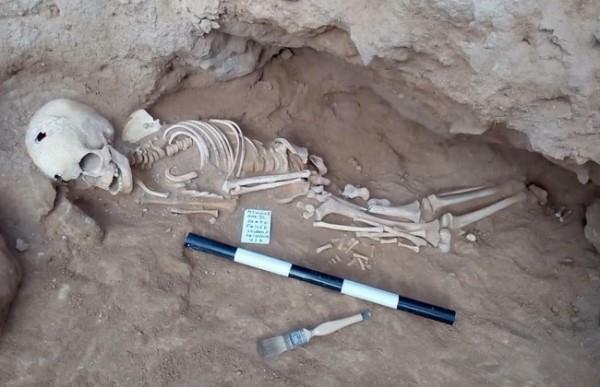 Last week, the ministry of antiquities also announced the unearthing of two Roman-period tombs at the archaeological site of Beir Al-Shaghala in the Mout village at the Dakhla Oasis. The discovery was a part of the excavation works which were being carried out at the area since 2002, and it resulted in the breakthrough of a total of 10 incomplete sandstone tombs from the Greek era.